a) The king of Samaria. 2. What were the accusations the Chief Priests and elders made against Jesus? a) That He claimed to be King of the Jews and was leading a rebellion. b) That He had desecrated their Temple. 3. To whom did Pilate send Jesus for questioning? a) King Herod of Galilee. 4. Did Pilate and Herod find Jesus guilty of the charges made against Him? 5. Who sent Pilate a message warning him not to do anything to Jesus? 6. Who did Pilate release instead of Jesus? 7. What was the place of crucifixion called? 8. When the soldiers gambled among themselves for Jesus’ clothing, they unwittingly were fulfilling a specific Bible prophecy. 9. To whom did Jesus say, “Today you will be with me in paradise”? 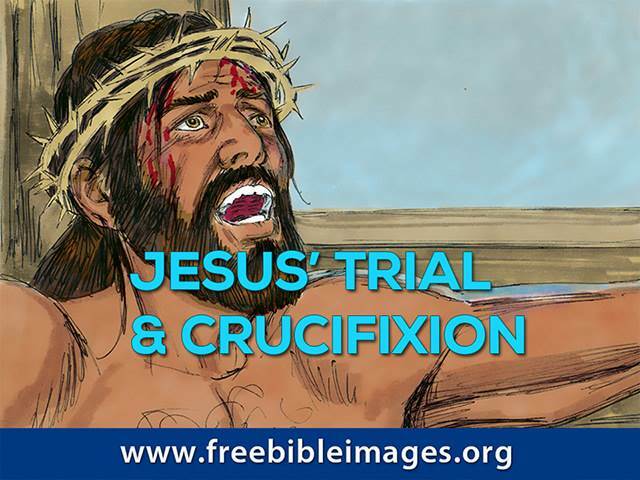 b) One of the criminals being crucified beside Him. 10. When Jesus died, what did the Roman centurion in charge of the crucifixion say?